This is a confirmed well-referenced unchallenged first in the history of radio. That alone is almost a first. Marie Zimmerman received the license for WIAE, Vinton Iowa in 1922. She was only 25 years old. (Donna Halper wrote the definitive article on this topic. You can read it here.) Born in 1894, decades before the rise of radio she was rather taken with it when introduced to radio by her brother-in-law Carroll, in 1920. Carroll was an electrician, and apparently a compelling ham radio enthusiast. He passed the bug to Marie and her husband Robert. They had built their own amateur receiving set by 1921. They enjoyed it so much that they decided to start their own station. 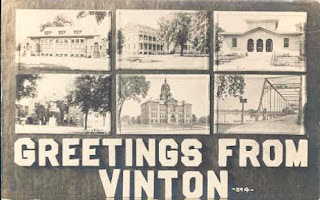 They and Carroll worked with the local Vinton newspaper, the Cedar Valley Times to fund raise the $300 budget it would take. More here. "It broadcast on Tuesdays, Thursdays, and Saturdays, usually from 9 PM to 10 PM, featuring music and news. On Wednesdays at 8 PM, there was a band concert; and on occasional Sundays at 2:30 PM, there was another live concert." On July 30th 1922, the Cedar Rapids Gazzette station WJAM signed on adding a second radio station to the local dial. That bit of well-funded competition cooled the Zimmerman's ardor for radio. In that era a radio license had to be renewed every 90 days. In April of 1923 Marie chose not renew WIAE's license. The Department of Commerce officially deleted the station in late June; it had lasted almost a year. Neither she nor her husband or even her gearhead brother-in-law returned to radio. Marie Zimmerman died on 23 January 1973, at age 77.